The 2016 election season has been somewhat of a roller-coaster for Hillary Clinton. Prior to the debates, primaries, and caucuses, Clinton was the putative Democratic nominee positioned to keep the White House on her party's side. But Vermont Sen. Bernie Sanders has proven to be a strong contender, and they've both won several primaries and caucuses — though Clinton is still far in the lead with more delegates and more superdelegates. Despite these victories, something odd has happened with Clinton's media coverage; some headlines about Hillary Clinton have seen publications almost negating her success by jabbing her with a negative reminder of her past with every turn. It's no secret that the things can be framed in very different ways, especially when it comes to politics. Getting readers to click an article is largely decided by the quality of the headline and subheadlines, which have to entice the reader or pique their interest somehow. In this way, when publications are acknowledging Clinton's accomplishments but reminding readers of her previous failures, they are creating a complex, almost dramatic narrative to accompany what should otherwise be a success story for Clinton. Journalism is all about language and word choice, so it's understandable that reporters use specific wording to attract readers' attention. However, this trend of framing Clinton's victories with negative word choice (think words like "rejection" and "defeat") is actually trying to negate her success thus far on the campaign trail, especially after she has gained momentum since South Carolina. As Jill Filipovic, former senior political writer for Cosmopolitan, points out on Twitter, The New York Times has brought up Clinton's past shortcomings when they report on her current victories. The original article's headline "Hillary Clinton Wins South Carolina Primary" is straightforward and to the point; the subheadline, though, highlights the problematic trend. By drawing attention to the African Americans who once "deserted" Clinton, The New York Times presents a narrative that leaves little optimism for the Clinton campaign. After a brief mention of her victory, the headline serves to recall Clinton's previous failures with that same demographic, which almost overlooks her historic and triumphant success in S.C. Similarly, The Atlantic published an article with the headline "Barack Obama's Heir" — a seemingly optimistic headline for a Clinton success story, but the subheadline told a different, more negative narrative. By winning over the black voters who rejected her in 2008, Hillary Clinton may clinch the Democratic nomination — and inherit the coalition built by the president who defeated her. After an ever-important win in South Carolina, Clinton's victory speech was all about confidence and strength moving forward this election season. Not only did Clinton beat Sanders by almost 50 percent in S.C., but she also garnered an overwhelming majority of support from African Americans. This year, Clinton won 87 percent of the black vote, and in the 2008 S.C. primary, Obama won 78 percent. The way in which these headlines disallow Clinton's success stories to be told properly is disheartening for many reasons, but especially since as the only woman presidential candidate, her triumphs are still being framed and overshadowed by her previous shortcomings. With another huge win for Clinton in Nevada, many of her supporters began speculating that her journey to becoming the Democratic nominee would be a bit easier. After all, she had 502 delegates to Sanders' 70 after Nevada, and a candidate needs 2,383 to secure the nomination. Despite this success, somewhat surprisingly, Fox News blamed the media for Clinton's momentum, noting that many headlines and articles began calling her the "inevitable" nominee. While it is virtually impossible for a candidate's success to be "inevitable," this headline once again shows how a victory for Clinton is nothing without trying to knock her down and downplay her success in some way. After beating Sanders by four points in Nevada, Clinton addressed the crowd with yet another confident victory speech proving her determination to carry out her campaign to the end. The article entitled "Hillary Clinton Celebrates Victory In Nevada With Call For Unity" highlighted the main message of her speech, but the subheadline forced a comparison to her rival candidate Sanders. "At times, Clinton sounded almost like Bernie Sanders," TIME noted, which wasn't necessarily an invalid observation, but still unfairly presented Clinton's victory and subsequent recognition of that victory as "Sanders-like." These monumental wins for Clinton should be able to stand on their own as content, but these headlines diminish her successes through reminders of past failures and comparisons to her rivals. Clinton has advocated for universal pre-kindergarten programs and for education reform to improve failing schools all over the country. In early October, the National Education Association endorsed Clinton, called her "a strong leader who will do what's best for America's students." In the most recent Democratic debate hosted by CNN on March 6, Anderson Cooper questioned Clinton about whether she thinks teachers unions protects bad teachers. After making her case and arguing that teachers are often the first blamed when schools don't perform well, the candidate received criticism from U.S. News & World Report. 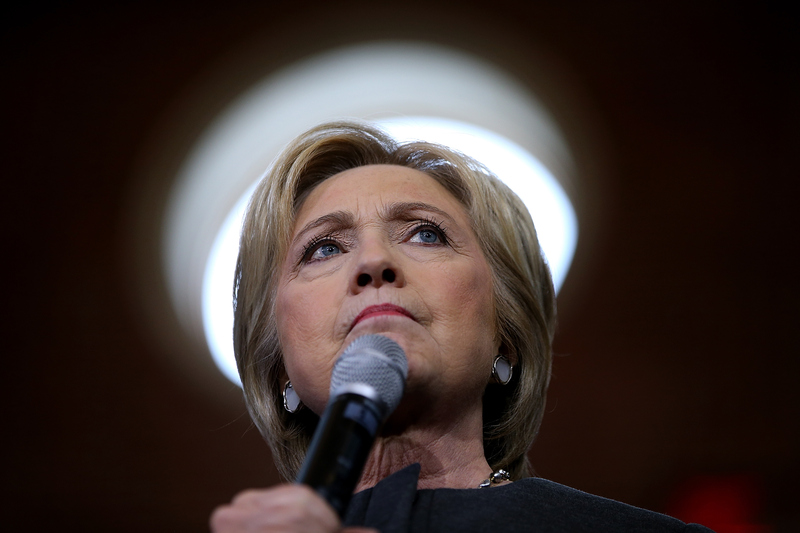 "In Debate, Clinton Goes to Bat for Teachers Union," the article's headline read, but the subheadline echoed other publications' negative coverage of Clinton despite her small victories. "It wasn't the first time Clinton has said exactly what teachers unions want to hear" was the article's subheadline, which argued that Clinton was disingenuous in her advocacy for teachers. This assessment seems unfair to Clinton, who not only has worked hard to receive the support of the National Education Association, but who has focused her campaign on education reform since the beginning.